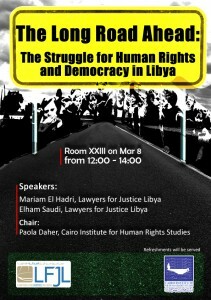 On Friday, 8 March 2013, the Cairo Institute for Human Rights Studies (CIHRS) and Lawyers for Justice in Libya (LFJL) held a side event entitled “The Long Road Ahead: The Struggle for Human Rights and Democracy in Libya” as part of the activities of the 22nd session of the United Nations Human Rights Council, currently convened in Geneva. The speakers at the side event were Elham Saudi, director of LFJL and Mariam Elhadri, UN advocacy officer of LFJL. The event was chaired by Paola Salwan Daher, UN advocacy representative at CIHRS. The side event opened with a short film documenting LFJL’s Rehlat Watan tour, part of its Destoori (My Constitution) project, during which LFJL members visited 37 different communities in Libya in order to discuss with and inform local residents about the constitution-making process and to foster a sense of ownership among Libyan citizens for their new constitution. The film covered a selection of human rights issues raised by those LFJL met on the tour , focusing on minority rights, women’s rights, torture, and impunity. The presenters discussed each of these topics further throughout the remainder of the side event. Elhadri pointed out that ethnic, political, cultural, religious, and economic minority groups are all facing difficulties – and in some cases severe violations to their basic rights – in the wake of the Libyan revolution. She referenced how many members of the Tebu minority were stripped of their Libyan citizenship under Gadhafi and how this continues to have serious repercussions on their rights as a minority group in Libya. She also pointed to the recent destruction of Sufi religious sites in Libya as evidence that the right to freedom of religion and belief must be clearly protected in the new Libyan constitution. As for the situation of women’s rights in Libya, Saudi explained that while most challenges facing women stem from cultural rather than legal problems, women still faced legal obstacles including the ability to pass on Libyan nationality to their children. She referred to the removal of a woman who was giving a speech before the General National Congress for not wearing a headscarf as a clear example of the cultural discrimination faced by women in the country. Saudi went on to discuss the ongoing use of torture in the country, pointing out that a culture of acceptance of such practices reveals the need for awareness-raising and trainings to inform Libyans about the meaning of torture and its repercussions. Elhadri also pointed out that Law 38 of 2012 was passed to grant amnesty for abuses committed in the name of the revolution, yet it does not specify whether torture and other international crimes are intended to be covered by this amnesty. She asserted that a draft bill to criminalize torture is currently being discussed but that the presence of Law 38 may leave the status of such a law unclear. The side event concluded with LFJL and CIHRS urging the member states of the Human Rights Council to strengthen the human rights component of the resolution on Libya, which was passed at the 19th session of the Council in March 2012 and is set to be reviewed and voted on again at the current session. While the Libyan government seems to be showing political will to promote human rights and to collaborate with the Office of the High Commissioner for Human Rights at the UN, it remains paramount that the resolution strengthen the role of the OHCHR in relation to Libya, including by granting it a clear mandate to monitor and report on the situation of and challenges to human rights in Libya, in order to enable the OHCHR to more effectively support the transitional process in Libya.